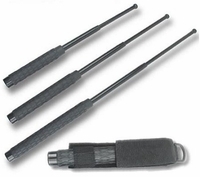 We carry a variety of expandable (telescopic) batons for self defense and law enforcement work. The best expandable batons made are by ASP and carry a lifetime warranty from ASP. Casco batons are excellent and less expensive. Casco batons are made by a subsidiary of Monadnock. Some Casco batons are being carried by the Los Angeles Police Department. We also have generic batons imported from China. These are good batons for occasional or emergency use. Always practice at least a little bit with a new baton. Open and close it and swing it around for awhile to break it in. If possible take some baton training to make sure you know how to use it and what the results might be.